I'm in the same situation as yours. Can I change my plan from $45 to $40 somehow if anyone has any idea? I just ordered a new SIM card using my old PM/ current Koodo number as verification, using the same process as before, and set it as "transfer in a phone number". Don't know if its going to work yet, but I managed to get an order confirmation. Hopefully Koodo can just move my number from my old 45/8gb to the new 40/8gb lol. My problem is my referrals - I am well below $30 / month at PM. But this could send a bunch of them to Koodo if they got it as well. I also just got the SMS. Almost impossible to resist. Combine with back to school deals for one of a lifetime kind of deal! I am glad I held off. Same problem here. I pay $69 every 3 months on my Fall 2016 plan, but if I lose a bunch of referrals, this offer is going to be pretty hard to turn down. I guess I will wait til September 4th to make a decision. Remember what happened earlier this year? The price increase from PM's 12gb/90days promo that was actually going against what they stipulated. Thus, failing. "This means that, as long as you are an active customer on this plan, your plan price will remain at $120, even after your initial 90 days. No surprises." 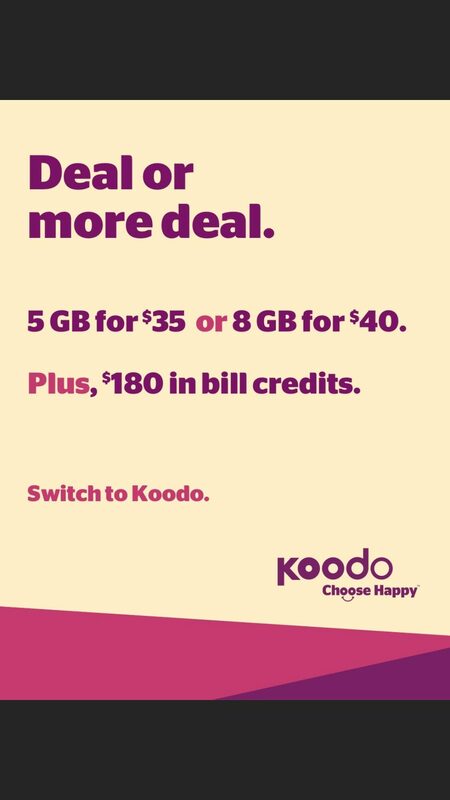 I say check for that on the Koodo promo agreement before signing on. If they have something similar, then the deal is totally worth it. If not, long term PM might still be better. I see a lot of PM promos plans for 3G, but cost more overall then the 12gb/90days promo. Anyone know if any of these plans are eligible for any tabs? I want to see what my phone options are, could be the deal I need to get an S9/S9+ within budget! I just got this same message. I usually use 2-3 gb but month but if i went to 8 i wouldn't even have to worry about offline playlists on spotify anymore. Did anyone get this on the $10 plan? When you enter the promo code, it prompts you for a validation code/ public mobile number. Does anyone know if there is a validation code, or does it only accept the PM number. CDA wrote: ↑ Anyone know if any of these plans are eligible for any tabs?